What are you looking for in a healthcare experience? Dr. Kane is a primary care physician licensed to diagnose and treat disease. However her focus is to help patients find optimal wellness and move away from the concept of “treating disease”. Health is not merely an absence of disease. Her goal is to thoroughly assess the patient’s current state of health, determine whether certain problems are critical, and systematically remove obstacles to health by creating a total wellness protocol. The ideal naturopathic patient recognizes and embraces self-responsibility for wellness, and is willing to make positive changes to improve and maintain excellent health. Although Dr. Kane sees patients of all ages and both men and women, she has a strong interest in women’s health and teaching women about their bodies and cycles. Self knowledge is key to maintaining good health. For younger women, understanding (tracking) the menstrual cycle is the first step to allowing this natural function to be a pleasure, not a “curse” as the menses are sometimes called. 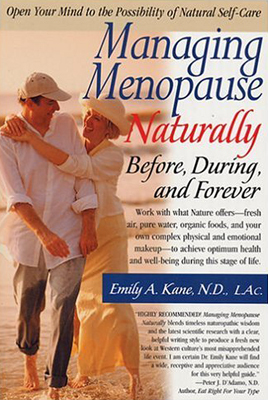 For women approaching or in menopause, please see Dr. Kane’s easy-to-read book on the subject. Fertility rates are declining, which is probably important for the planet, but can be heart-breaking for individuals. Talk to Dr. Kane about natural methods before going high tech. Good diet, daily movement and other fundamentals like sufficient sleep, drinking mostly water and having happy relationships, are foundational to good health. The basic “three legged stool” for a stable life is satisfaction in work, home, and significant other(s). Beyond that let’s build health. Food choices that are made wisely every day, every meal, every shopping excursion will build good health. If possible choose a plant-based diet which features organic produce. It’s fine to eat high quality eggs, our fantastic Alaskan salmon and occasionally venison for protein. Try to move away from wheat, meat and cheese. These steps will be taken slowly, as feasible. Inserting slender sterile needles into specific points on the surface of the body derives from an ancient method of stimulating health and has been used successfully for hormonal, gastrointestinal, and pain syndromes and for emotional balancing. Dr. Kane is trained in Traditional Chinese Medicine (TCM) but mostly uses Japanese style needles (very fine and flexible) along with heat, massage and friction. Most people find acupuncture sessions not only effective, but very relaxing. Other treatment modalities favored by Dr. Kane include herbal remedies (in liquid form they can be customized), vitamin and mineral recommendations, blood ozonation and various forms of body work including Bowen technique for TMJ. Much of the interaction with the doctor in her office will be discussion — because YOU are going to tell her what’s wrong, and lay out your priorities. Dr. Kane is passionate about performing a good physical exam, head to toe, because the body communicates health status readily if we pay attention. Physical exam may include blood draw (most samples are sent to LabCorp in Seattle, but some are processed locally) or may include referrals to Bartlett for diagnostic mammography, x-ray or ultrasound. As a primary care doctor in the field for nearly 30 years, many challenging conditions have been presented to Dr. Kane. The patients that can benefit immediately tend to be those that are inclined to find health without pharmaceutical intervention, or those who have “tried everything” and still don’t feel well. Sometimes patients want help with chronic digestive complaints or anxiety or insomnia or allergies. She works frequently with patients diagnosed with auto-immune and neuro-degenerative diseases, as well as more common conditions involving compromised sleep or digestion. Dr. Kane will be very clear with you if she needs to make a referral. For example, she is not an oncologist. Although she works with many cancer patients and can help guide them through their treatment options as well as promote wellness during the treatment phase and beyond, she will insist on working in a team with an oncologist as well. The healing power of nature is the inherent self-organizing and healing process of living systems which establishes, maintains and restores health. Naturopathic medicine recognizes this healing process to be ordered and intelligent. It is the naturopathic physician’s role to support, facilitate and augment this process by identifying and removing obstacles to health and recovery, and by supporting the creation of a healthy internal and external environment. Naturopathic physicians utilize methods and medicinal substances which minimize the risk of harmful effects, and apply the least possible force or intervention necessary to diagnose illness and restore health. Whenever possible the suppression of symptoms is avoided as suppression generally interferes with the healing process. Naturopathic physicians respect and work with the vis medicatrix naturaein diagnosis, treatment and counseling, for if this self-healing process is not respected the patient may be harmed. Illness does not occur without cause. Causes may originate in many areas. Underlying causes of illness and disease must be identified and removed before complete recovery can occur. Symptoms can be expressions of the body’s attempt to defend itself, to adapt and recover, to heal itself, or may be results of the causes of disease. The naturopathic physician seeks to treat the causes of disease, rather than to merely eliminate or suppress symptoms. Health and disease result from a complex of physical, mental, emotional, genetic, environmental, social and other factors. Since total health also includes spiritual health, naturopathic physicians encourage individuals to pursue their personal spiritual development. Naturopathic medicine recognizes the harmonious functioning of all aspects of the individual as being essential to health. The multifactorial nature of health and disease requires a personalized and comprehensive approach to diagnosis and treatment. Naturopathic physicians treat the whole person as an individual, and taking all of these factors into account. The prevention of disease and the attainment of optimal health in patients are primary objectives of naturopathic medicine. In practice, these objectives are accomplished through education and the promotion of healthy ways of living. Naturopathic physicians assess risk factors, heredity and susceptibility to disease, and make appropriate interventions in partnership with their patients to prevent illness. Naturopathic medicine asserts that one cannot be healthy in an unhealthy environment and is committed to the creation of a world in which humanity may thrive. A definition of this philosophical and scientific system of health care might begin with the European term “nature cure.” Literally, naturopathy means healing a “pathos” by the power of nature; that is, pure water, clean air, sunshine and wholesome foods. Whereas physical well-being undeniably relates closely to the sound use of good foods, Naturopathic treatments consider the whole person — body, mind and spirit. The Naturopathic doctor is trained to assess the underlying cause of an ailment, and work towards removing the obstacles to good heath, which will naturally dispel the disease symptoms and minimize their recurrence. Naturopathic doctors graduate from a four-plus year post-graduate program with training in clinical nutrition, homeopathic medicine, botanical medicine, physical medicine, natural childbirth, Oriental medicine, minor surgery, pharmacology, counseling and stress management. How does conventional allopathic medical training compare with naturopathic medical training? Because naturopathic physicians are trained to search for the root cause of pathology, and to consider the entire individual when devising a treatment plan, naturopathic education requires a lot of reasoning and prioritizing, plus even more memorization than in the conventional program. The naturopathic curriculum is so intense and comprehensive no medical doctor anywhere in North America has yet mastered enough naturopathic science to have passed the naturopathic clinical board exams, unless of course, they also went through the entire 4-year naturopathic medical curriculum. A number of other health professionals have attempted the naturopathic clinical board exams, in jurisdictions and at times where it was allowed for others to sit for those board exams. One veterinarian passed those exams once, and no one else aside from naturopaths. Those exams are administered by the North American Board of Naturopathic Examiners (NABNE). What is a full list of the services you provide? Fill out and submit the web contact form here. At Main St, come up the hill to 5th Street. Turn right. Cross over Seward, Franklin and Gold Streets. Between Gold and Harris streets, on 5th, there is a small parking lot on the right, opposite the big blue Catholic parish hall. There are 6 metal stairs up to the clinic entrance, which is covered by a green awning with the words “Gold Street Building” in yellow. Come into the waiting room through the door under the awning. If you are a new patient, your paperwork will be inside, around the corner from the waiting room area, right outside my inner office door: number 329. Please fill out the yellow intake form in the waiting room, and help yourself to spring water. If you wish to complete intake form before your first appointment you can print out this 2-page Patient Intake Form [PDF] beforehand. How much do you charge per appointment? The charge for a first-time office visit, which includes a complete medical intake with basic physical exam, costs $250 and is scheduled for 90 minutes. A return office visit is generally one hour and the charge is $175. For telephone or email consultations the charge is $50.00 per 15-minutes and must be pre-paid by MC/Visa before the consultation. If you are an established patient there is no charge for a quick question by phone or email. For a more extended reply I will charge you for my time comparable to an office visit. However, I will not give medical advice about a new diagnosis nor modify a treatment protocol without a scheduled appointment. What insurance will you accept? Insurance reimbursement for my services is provided by all carriers in Alaska and Washington state. Unfortunately Medicare and Medicaid do not yet reimburse for naturopathic care. How can I read Dr. Kane′s published work? Dr Kane has published a column called “Ask the Naturopath” for various offshoots of Prevention Magazine (Los Angeles, CA) since 1990. The current magazine “Better Nutrition” is available locally at Rainbow Foods and the GNC store in the Nugget Mall, free, every month. You can read most of the articles printed in those magazines over the past 30 years here on this site by visiting the Articles section or searching by keyword in the search bar above. You can also purchase a signed copy of Dr. Kane’s book, “Managing Menopause Naturally, Before, During and Forever” here.